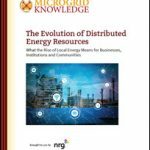 Distributed energy management systems (DERMS) and smart inverters can together help efficiently and safely bring distributed energy onto the grid, as described in the fourth part of a Microgrid Knowledge Special Report series on DERMS and virtual power plants. As use of renewable energy grows, grid management becomes more complex for utilities and grid operators. The same inverters that are required to export renewables onto the grid are also the key to protecting the grid’s feeder lines, ensuring the uninterrupted flow of electricity when used within the context of grid reliability needs, without driving the need for excess fossil reserves. Inverters are necessary to convert DC voltage from solar panels and other sources of renewable energy, such as asynchronous wind turbines, to AC grid voltage. However, legacy inverters lack the flexibility to manage large penetrations of renewable energy and ensure system reliability. For example, most legacy inverters autonomously disconnect from the grid at specified frequencies or voltages. IEEE 1547 requires full disconnect at nominal voltage +/- 10 percent for excursions longer than two seconds. If there is a sag or spike in voltage that reaches this threshold — caused by rapid changes in renewable solar photovoltaic output — the inverter will cut off, potentially exacerbating the voltage excursion even further on the system. This may also look like a fault to the protection equipment installed on the feeder or can lead to voltage collapse, both resulting in systemic power outages. Smart inverters can prevent these problems. They can be managed so that they continue to allow power to flow when traditional inverters would shut off. Smart inverters are remotely programmable devices that allow precise control of ramp rates, outputs and inputs of the converter. Their thresholds are adjustable, which means they won’t just cut out in the way traditional inverters would. Smart inverters not only regulate line voltage, but also allow for two-way communication with utility control centers. In addition, advanced capabilities such as frequency and voltage sensing mechanisms allow smart inverters to detect grid abnormalities and send this information back to utility operators. Smart inverters can also operate under a variety of situations, including when a battery is being charged or solar energy is offered to the grid. “We are now able to sense in real-time voltage signature and power flows on a distribution feeder — and control smart inverters to regulate conditions to support the grid,” says Eric Young, vice president, industry solutions for Enbala. When connected to DERMS, smart inverters can respond to signals from the utility to stabilize the grid. DERMS can, in real time, reprogram the smart inverter so that the inverter can optimally respond to events on the grid, such as the aggregate generation of significant amounts of solar energy on a specific distribution circuit. With DERMS, smart inverters can respond to signals from the utility to stabilize the grid. Operators can use DERMS to exercise this control remotely without overloading the same operators with the detailed data produced from tens of thousands of individual units. Combining DERMS and smart inverters is a powerful way to protect feeder systems on the power grid, dramatically reducing the risk of voltage collapse, blackouts and brownouts. The ability to manage smart inverters remotely can allow utility operators to control solar installations as they would traditional fossil-power plants, regulating electricity generation based on the real-time energy demand of customers in an elegant, optimized and resilient way. DERMS can precisely control today’s smart inverters and enable the utility operator to tailor them for specific grid conditions. If it is apparent that an event will occur on the grid — such as cloud cover approaching a PV installation that will lead to a sag in voltage — an operator can adjust the threshold at which the inverter drops due to a low voltage condition. In this way, the solar PV, which is attached to the inverter, can still be producing energy and supporting the voltage on the grid while the inverter prevents the voltage from dropping further. With less sophisticated, earlier inverter technology, when thresholds are reached, everything is shut off, further dropping the grid voltage. Inverters are necessary to convert DC voltage from solar panels and other sources of renewable energy, such as asynchronous wind turbines, to AC grid voltage. Under DERMS control, smart inverters can also dynamically regulate the power factor on local distribution lines, which helps to maintain line voltage. Utilized this way, the reactive power capability of smart inverters is intelligently used to support the voltage on the power system, reducing losses and allowing more renewable energy to be supported on a given line segment or distribution feeder. The old adage, “reactive power does not travel well,” has been widely understood for decades. DERMS can provide voltage ride-through that helps keep solar generators connected to the grid during times of low-grid voltage, while triggering charging actions when solar production is exceeding demand — all in one system. Additional smart inverter functions, which can be controlled by DERMS, include active power curtailment to help balance power generation and load. In addition, DERMS can provide voltage ride-through that helps keep solar generators connected to the grid during times of low-grid voltage, while triggering charging actions when solar production is exceeding demand — all in one system. When connected to DERMS, smart inverters can respond to signals from the utility to stabilize the grid. Flexible smart inverters are key to maintaining grid stability in the presence of highly variable renewable energy sources such as PV. Smart inverters are crucial to bringing more DERs safely to the grid. This technology can allay worries that the variability of new sources of electricity will disrupt utility services. Young concludes, “When paired with DERMS, smart inverters respond with speed, intelligence and flexibility at the local level.” This is just what’s needed to solve the difficult challenges faced by utilities and grid operators as they strive to smoothly integrate a quickly growing supply of renewable energy attached to their systems. 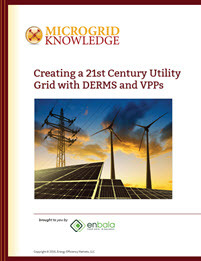 Download the full report, “Creating a 21st Century Utility Grid with DERMS and VPPs,” courtesy of Enbala, to learn more about how these tools are changing the face of the 21st century power grid. 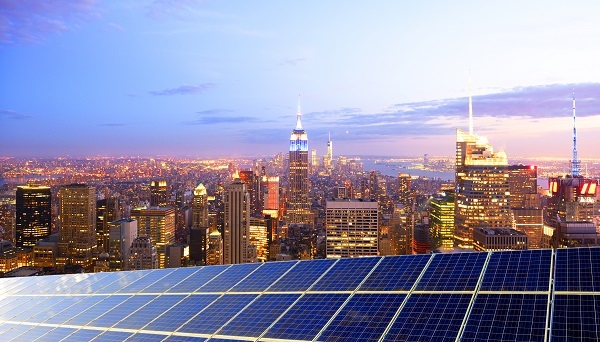 What are Distributed Energy Management Systems (aka DERMS)?